Gary the stegosaurus was just fired from this pirate job. But it was *not* his fault! From mis-sized clothes to almost sinking the boat from his weight, Gary has a tough go at being a pirate. Gary tries his best, but how was he supposed to know the poop deck isn't a bathroom?! Kids who like dinosaurs or pirates will enjoy Gary's fairly amusing mishaps. 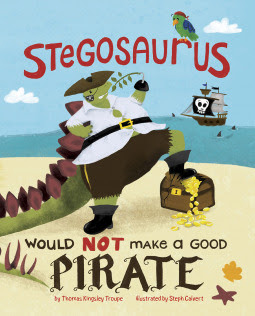 If you’re interested in reading A Stegosaurus Would NOT Make a Good Pirate, you can purchase a copy here on Amazon.